Hello, and a very happy Sunday. Just popping in to tell you that it is time for a new challenge at The Ribbon Girl. And it's an easy one... just use ribbon or twine on your card! 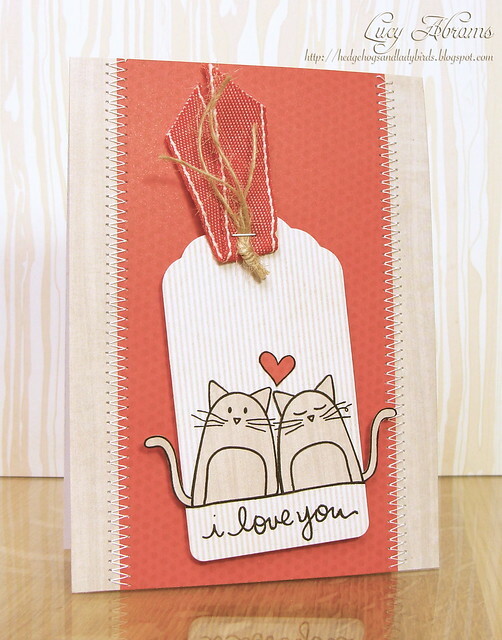 For my card, I used both, and one of my favourite stamp sets, the cute Furry Kisses from Simon Says Stamp. Such a sweet card! Those kitties are ADORABLE and that ribbon it totally divine!!!! Sweeeeet card! Love the denim ribbon! The Furry Kisses stamp set is one of my favorites, too. I like how you used it on the card. This card is purrfect! I love the design of it. You do beautiful work. I am a new follower and found your blog from the blog hop. Glad I did. Thanks so much for the 'heads up' on the challenge! Darling card! I have 2 cats...wish they "loved" each other like the image. One fur baby constantly picks on the other one. LOL! !